The current SWM system in Lebanon has many disadvantages such as: unorganized source reduction programs, high cost of sweeping and collection and low percentage of waste recovery. Several recommendations have been proposed to improve waste management, such as, organizing public awareness programs, which could start from the schools; increasing efforts for recycling, keeping in mind future population growth, resource recovery, strengthening capacity of municipalities and encouraging public private partnerships. The roadmap for Lebanon to treat the waste may include the following. First, the citizens should be encouraged to participate in waste management by splitting their wastes into glass, plastic, paper, textile, electronics, and organic. Another process of separation should occur after collection, to ensure appropriate segregation of domestic wastes. The recyclable refuse is then sent to a recycling plant, and the organic waste gets composted. Finally, the remnants get disposed of in sanitary landfills, where methane gas could be recovered and used to produce energy. Considering the implementation of such a process, Lebanon could be capable of transforming its waste from a burden on the government to a source of revenue, originating from the sale of recyclable materials and power generation. As such, Lebanon Expo is working with the Ministry of Environment on the waste management crisis. 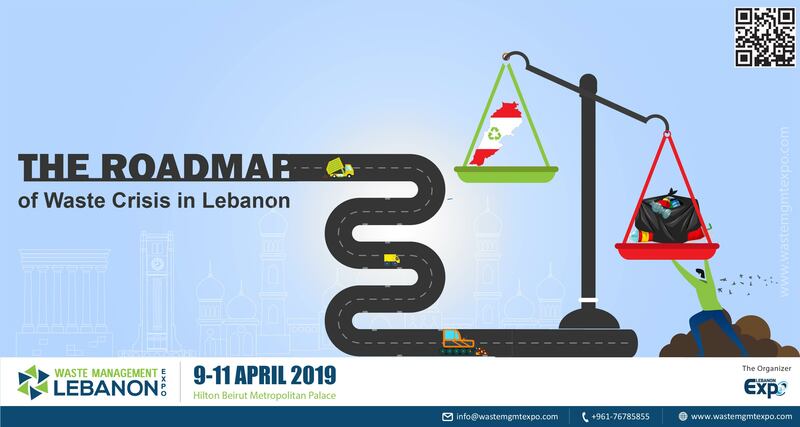 In partnership with MOE, we are organizing the Waste Management Exhibition and Conference 2019, which will be from April 9 to 11 2019 at Hilton Beirut Metropolitan Palace.